I finally get to show you some Oh Clementine! This is my second fabric collection for Windham Fabrics. It will be showing at Quilt Market in Pittsburgh, and shipping in early September. I’m really, really happy with this collection…the colors and prints have that “fresh farmhouse” feel that suit me perfectly. My Mom saved the day and swooped in to make a few things for me to photograph for the Look book (link coming soon!). I have some quilts to show you in the next couple of weeks…and a recipe for the Lemon Cheesecake I ate for breakfast, lunch, and dinner yesterday. I turned my artwork in for this line the end of last summer after working on it for months, little by little. I knew what I wanted with this line…and Windham let me roll with it and have free reign…which is amazing for a manufacturer and I’m so grateful to them. Just looking at these colors makes me ready for summer…now! Happy Quilting! 108 Responses to Oh Clementine! It's so sunshiney good! Congratulations. Love all your wonderful photographs and projects. So gorgeous, can't wait to get my hands on some! This is so adorable! I assume new patterns as well? Beautiful fabric. Can't wait for it to be in stores. Oh my!! This line is just darling! I can't wait to get my hands on some and start sewing. Congratulations on your new line. It's lively, fun, cool full and yet has a good grounded feeling with the softness of the brights. It looks great. Sweet fabric. My great great grandmother was named Clementine. Her granddaughter (my grandmother) shared it as her middle name. OMGoodness! This is the prettiest collection of fabric that I've seen in a LONG time and I can't wait for it to come out! It's just beautiful and fun! Congratulations! Hi!!! Wonderful fabric!!!! Love the colors and the prints!!!!! Beautiful!!! Beautiful colors! Congratulation! I love it! Beautiful, the colors are so happy. Congratulations. Beautiful!! I am so impressed with all the prints and I bet it is fantastic to work with a company like that :) Thank you so much for sharing!! Love it! I can't wait to see more! It is Delightful! Congratulations on such a fun happy collection. I LOVE this fabric line. I have to have one of each! Congratulations Allison! I do love your farmhouse style in fabric! Yum! Great new fabric designs, Allison! Can't wait until Sept ~ I need entire collection now! Oh, my darlin' Clementine is beautfiul. I'll have to have some of this! I'm in love with it! It's absolutely perfect. I can't wait for this to come out!! This is so sweet and fun! Love! Wish I had it for this summer!! I love this line. What lovely fabrics! Congratulations !! As always, I love everything you do! How do you do it, do you stalk me or something? I'm sure you would have plenty of time to do that with the kids, patterns, fabric, etc. Curious, will the scraps from these go well with Wallflowers? Oh wait, I need actually cut into the Wallflower fabrics to have scraps. wow, i am so in love with this collection! you are so talented. 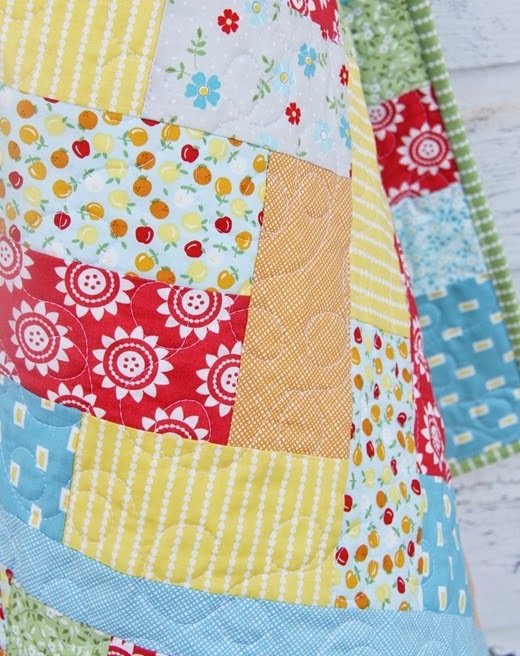 can't wait to see more photos of your quilt! love those little apples! I love this new line! I can't wait until September! Oh my goodness, gosh, I LOVE IT..It is so farmhouse fresh, it just screams my name, all the colors of my home, so much FUN!!! Hi Al, This new line is adorable and oh so you! I am so happy for your successes and will miss you in Pittsburgh! Congratulations on another lovely hit in your ever growing line of accomplishments! Yay!!!! Congratulations…this line is amazing!! You must be absolutely thrilled. 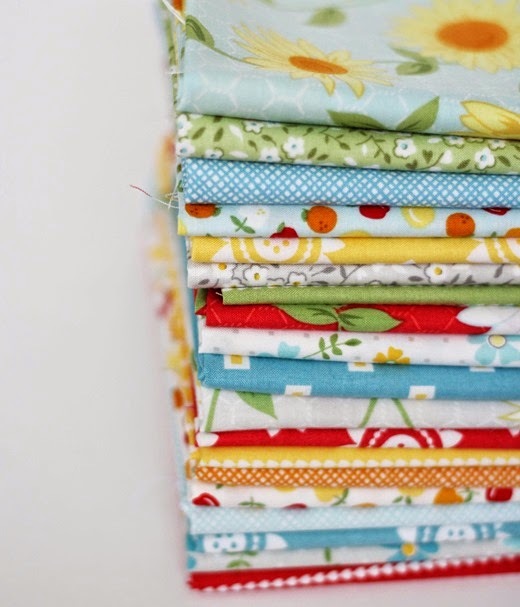 What a beautiful fabric line…love the patterns and colors are so cheerful!! I love this fabric; you've done a great job. Congratulations! How exciting!! I LOVE the colors and prints! Can't wait for it to come out! That is just gorgeous! Love all the prints in the line. Just beautiful! You are so talented and I love the darling little dress. Congratulations! It's such a pretty line, Allison! 30s prints are my favorite but I love updated fresh modern 30s inspires even better! I like the name of the line–my sister and I had two dogs when we were growing up, Rosebud and Clementine. My birthday is September 10th so you know what I'll be asking for:). And kudos to windham for letting you be the designer! BEAUTIFUL , I wish I lived 5 minutes away. I would love to play with these fabrics. I can't wait to buy them. SO fresh and pretty – just what we all need these days! 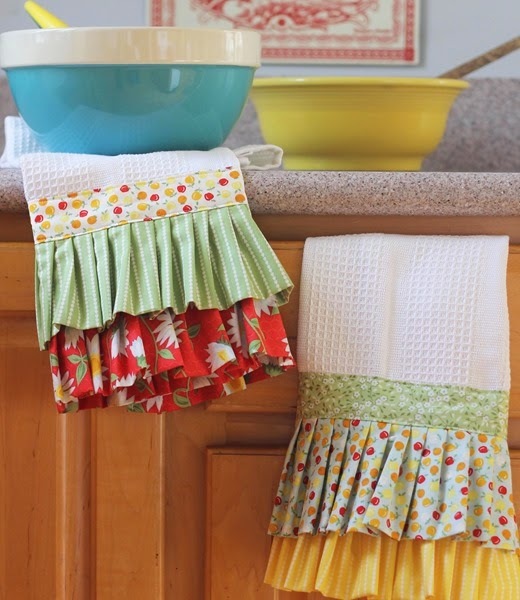 The patterns for the quilts will be marvelous and hope you publish those darling kitchen towels, too! Congratulations! I love this fabric! Going to have to get me some! This is beautiful. I'm so sad that it won't be out in time for my daughter's sunshine themed first birthday in June. I'd love some of those for her dress! Congratulations! It's a beautiful collection, I cannot wait for it to come out! Absolutely yummy! Love the colors and adorable patterns. Scrumptious, is it summer yet? Such sunny and fun fabrics. Congratulations! Sooo pretty! It just smiles and smiles of long, warm, happy days! I think we all in North America cannot WAIT for summer this year of awful winter that was. I love the little sundress too! So sweet. Must be so rewarding to see this after so many months, very happy for you! Congrats on the new line. Its very cute and cheery. Oh, this looks so yummy! I will have to get some of this line. Wish I could get it all. Those little teases you've given us make me drool. Great designs. So fresh and colorful! Congratulations! I'd love to do a giveaway CJ….when I get a bit more yardage after market I for sure will! 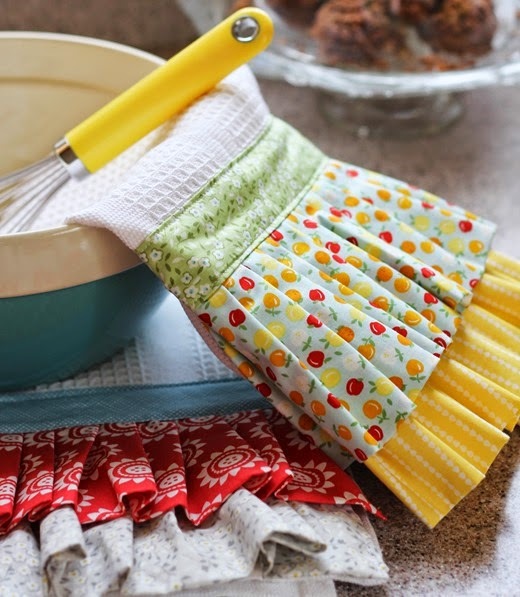 A great new fabric line and a lemony cheesecake recipe to follow!!! Woohoo! This is a gorgeous fabric line indeed! So bright and cheery. Congratulations! Beautiful Fabric line!! Congrats!! I will be watching for it! It's super lovely Allison!!! awesome awesome job! Fantastic collection and I love how it so fits your style. Very excited about these fabrics! 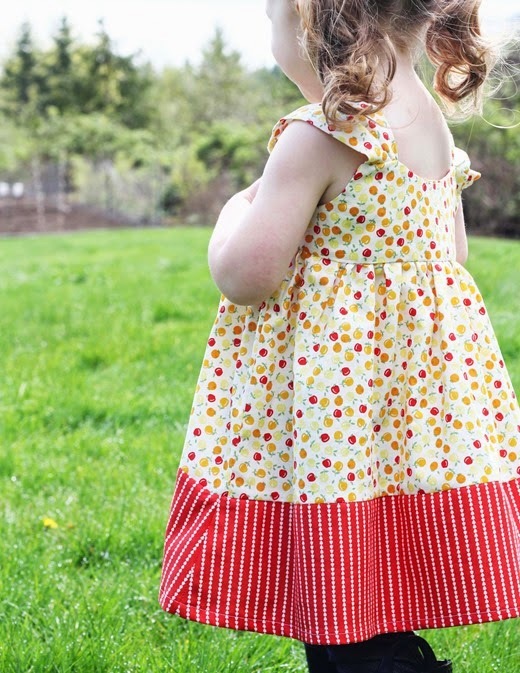 Love the apples – very sweet and farm vintage and love the sunflower buttons tons too! Congrats! This collection will be on my BUY IT list for sure! Loving the bright and happy colors! Gorgeous! I'll definitely be buying several of these when they become available. So sweet, bright and cheerful. And cheesecake for breakfast, lunch and dinner? Ummm, yes please! Right now my favorite print in this collection is the daisy on red background — but I could find a use for ALL the prints in this collection. Definitely a must have! LOVE LOVE LOVE LOVE LOVE this line! It is so fresh and easy! I love it. It is also very you. I can't wait to get some. Maybe I will have to pull in some favors with friends at Sample Spree! There are so many fabrics that I want to stash for basics in there. Can't wait! Looks like a lovely line–so fresh and spring-y. Love how happy this fabric is. I can't wait to see it in the stores. Beautiful fabric! Can't wait for Sept.
Love that sweet dress ! Is that your pattern? Nope that's not my pattern Lillian….it's actually a See and Sew pattern from Joann's…it's quick and easy! I just love your new line and the fresh bright colors. I used to have an apple dress like that…. Congratulations! Fabuloso! Greetings from the UK. 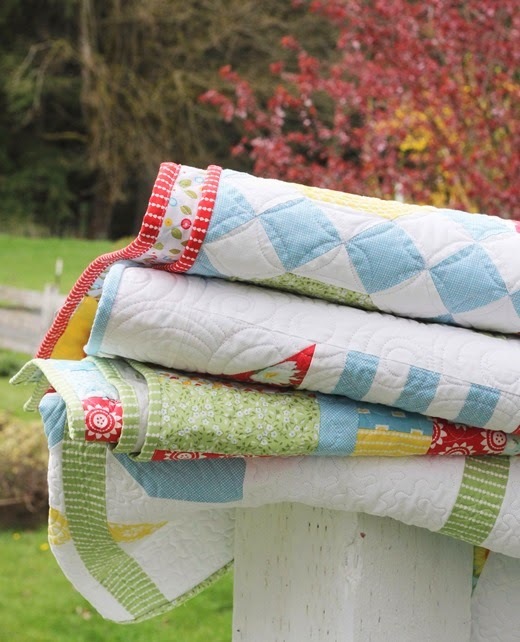 Really love your blog and especially the latest quilt designs. The free hand quilting is really superb. love the new fabric line.. Its so bright and cheery. Cant wait to make wallflower with it. Lovely fabrics, and your Mum has done a great job sewing up some accessories. I moved to live five minutes from my parents, and now they go on so many more holidays too! What's with that?! Just saw this new fabric line over on Hawthorne Threads website and the lookbook. I like it even better than your first line! Great to see the ditsy prints and blenders in the line, along with that splash of red. Excellent! Hi, Allison, I recently read through your blog, pinning as I went. 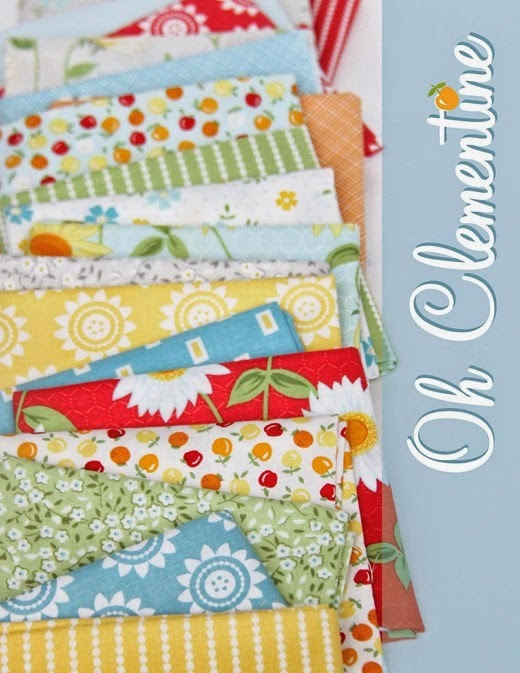 I ordered Clementine fabric and did a copy cat of your Mom's beautiful kitchen towels. I'd like to write a blog post along with the tutorial I put together, and of course will link back to you as fabric designer and this post … with your permission, if that's okay.